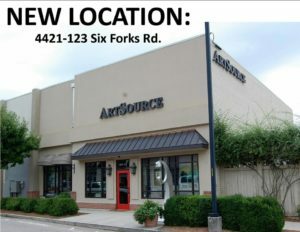 ArtSource has recently relocated and expanded into a larger, more expansive gallery located behind Bonefish Grill and across from Brother’s Cleaners at North Hills. Located in the vibrant urban “Midtown” area of Raleigh, ArtSource is easily accessible from all major thoroughfares. Our gallery is located on street level and is handicap accessible. We have ample parking in the lot adjacent to our gallery.